Remember the discussion over the definition of 'on a beat to weather'? Well, that's been resolved with a recent change to Case 132. 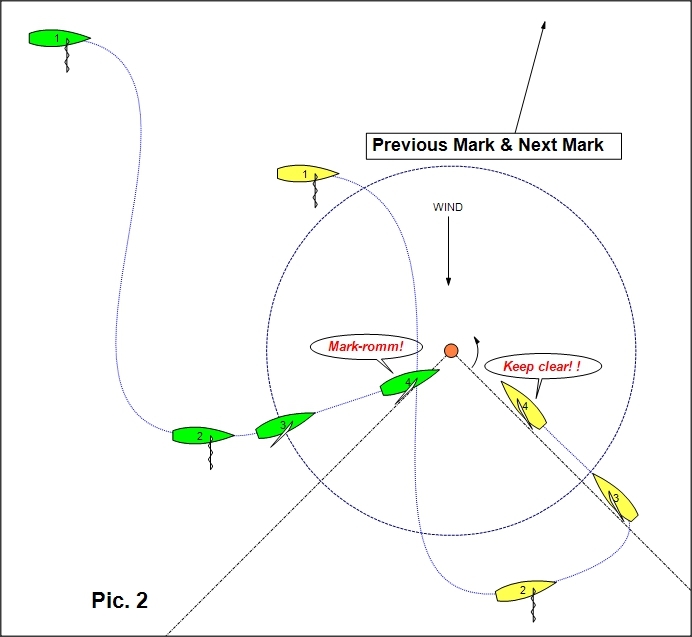 I think it does a nice job covering the scenarios in the ‘5-boat/scenario drawing’ in our previous thread and appears to cover the other less obvious scenarios like beating back to pass the leeward mark after being blown well to leeward of it and boats meeting at passing marks. Thanks Paul for bringing this to our attention. Just to ensure I understand: for the second question, around 42.3(c), if a boat sailing upwind has overstood the weather mark (i.e., their course to the weather mark is below close-hauled), they may attempt to plane or surf, subject to the limitations of rule 42.3(c) in particular and rule 42 in general? I think you are correct Al. It seems that the limitations of 42.3(c) only apply when a boat's course is close-hauled or above. What mean the words "a windward mark" in Case 132? P.S. I think that in our case (a fleet-race) we cannot be guided the interpretation by MR CALL N1. Ang, if I understand you correctly - you think that the proper course at the mark for Yellow is to tack? Well, then I'll change the picture a little. Boris .. thought I'd respond while Paul works on the image upload issue. So, yea .. I thought given your drawing the argument could have been made that Y's proper course would be to tack at the mark. As drawn, Y was on a tight-beat at 40 deg to TW, on a track not clearing the mark, and the course to the next mark relative to the wind had port-tack significantly favored. Given that, I thought that in the absence of Green, Yellow would tack prior to reaching the mark as not to risk hitting the mark or slowing too much as they luffed to pass it. Assuming that your updated drawing puts Yellow above the layline to the mark so that Y can pass it without slowing, then I think Case 132 "Situation 2" illustrates the scenario. As far as your question "What mean the words "a windward mark" in Case 132?" .. this is how I look at it in the context of Case 132. The mark could be a windward mark, a finishing mark at the port end of a finishing line, a windward gate mark, or a limit mark that is not a rounding mark. In each of these situations, the boats shown are ‘on opposite tacks on a beat to windward’ and, therefore, rule 18 does not apply between them. I'm assuming that English is a 2nd language for you, so what I write here assumes that's true .... as what I'm going to describe is a subtle English-language point. The first thing I would note for you is the context of how the term appears in the sentence. In this case, the use of the term "could be" precedes the list. I would interpret that as indicating that what follows is a list of items which are to serve as examples, but not a complete or definitive list. I think the intent is for the reader to consider the examples together and as a whole to develop a larger idea and understanding. Windward Mark: A rounding-mark on the current leg of the course which is upwind from a boat's current position, or relative to the starting-line, which would require a boat to sail on a beat to reach and round it on its proper side. .Windward Mark: A rounding-mark on the current leg of the course which is upwind from a boat's current position, or relative to the starting-line, which would require a boat to sail on a beat to reach and round it on its proper side. Is it apply for the Case 132? Boris .. Wow .. that's some scenario. I'm certainly no authority on the updated Case 132 (for that matter I'm not an authority on anything) .. but you know me, I'm willing to take a public swing at any pitch. I hope that others on the thread will feel free to point out if/when I miss the mark. RRS 18.2(a) applies, Blue owes Green mark-room which Blue fails to give. Thanks for the detailed analysis, Angelo.
? What is "over standing" ? P.S. 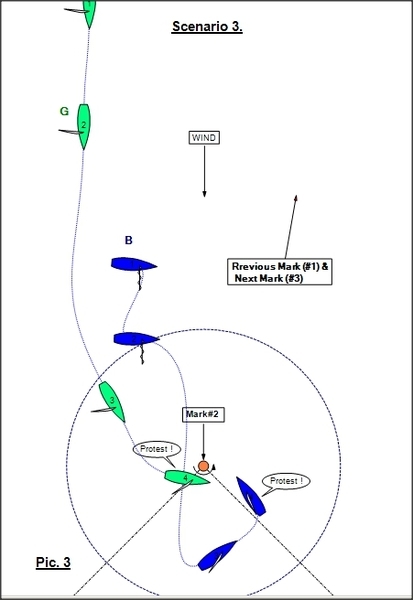 Case 132 says "when one or both of them have overstood the close-hauled layline..."
in your Scenario 2 both boats approach and enter the zone on a beat to windward. At that moment, we look at our RRS 18.1 tests, and look to the situations outlined in Case 132. If you take your Scenario 2 drawing and delete position 1 and 2 (which is valid .. only consider 3 and 4), then it matches Case 132's Situation 2 exactly. in your Scenario 3, as I outlined above, each time 18.1's exclusion tests are applied, they fail (IMO). Now, I'd like to see other's input on whether or not they agree with my conclusion at 3.2 above. That's the place one has to argue I've got it wrong to bring Case 132 into play I think .... and where I'm on the softest ground. As to the meaning of "over standing" is .. here is my WAG at it. "Over Standing" : A boat "over stands" when, while sailing toward either a windward or leeward mark, the boat sails past the optimum layline while accounting for the boat's sail-plan, wind, sea-state and current.